The story of Orpheus & Eurydice came from the Greek Myths. 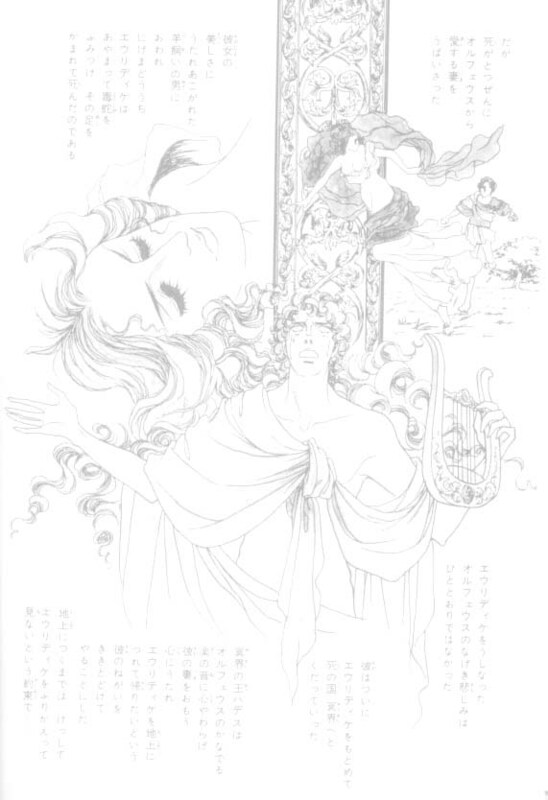 Orpheus was the son of Apollo and the muse Caliope. He was presented by his father with a Lyre and he taught him to play upon it. Not only his fellow-mortals but wild beasts were softened by his strains, and gathering round him laid by their fierceness, and stood entranced with his lay. Nay, the very trees and rocks were sensible to the charm. The former crowded round him and the latter relaxed somewhat of their hardness, softened by his notes. Eurydice, shortly after her marriage, while wandering with the nymphs, her companions, was seen by the shepherd Arsitaeus, who was struck with her beauty and made advances to her. She fled, and in flying trod upon a snake in the grass, was bitten in the foot and died. Orpheus sang his grief to all who breathed the upper air, both gods and men, and finding it all unavailing resolved to seek his wife in the regions of the dead. As Orpheus sang out his wish to beseech Hades and Persephene to grant him Eurydice again, all that were present were overwhelmed by his sadness. Bulfinch wrote beautifully about this scene. As he sang these tender strains, Tantalus, in spite of his thirst, stopped for a moment his efforts for water, Ixion's wheel stood still, the vulture ceased to tear the Prometheus' liver, the daughters of Danaus rested from their task of drawing water in a sieve, and Sisyphus sat on his rock to listen. Then for the first time, it is said, the cheeks of the Furies were wet with tears. Hades and Persephene listened and yielded to Orpheus' pleading. Orpheus was permitted to take her away with him on one condition, that he should not turn around to look at her till they should have reached the upper air. They proceeded up the dark and steep passages in total silence until they had nearly reached the outlet into the upper world. Orpheus, in a moment of forgetfulness, to asssure himself that she was still following, cast a glance behind him, when instantly she was borne away. Stretching out their arms to embrace each other, they grasped only the air! Dying now a second time, Eurydice yet cannot reproach her husband, for how can she blame his impatience to behold her? "Farewell, " she said, "a last farewell," -- and was hurried away, so fast that his sound hardly reached his ears. Do not copy without the author's permission. His efforts to seek once more her return were in vain. Seven days he lingered about the brink, without food or sleep; he sang his complaints to the rocks and oaks, he held himself aloof from womankind and dwelled constantly on the recollection of his sad mischance. He rejected the Thracian maidens and they screamed to drown the music of his lyre which protected him. Now the weapons had hit Orpheus. Then the maniacs tore him limb from limb, and threw his head and his lyre into the river Hebrus. The Muses gathered up the fragments of his body and to sing over his grave more sweetly than in any other part of Greece. His lyre was placed by Zeus among the stars.